2 How to Store Wine at Home? This 6-bottle capacity wine cooler is the right size for beginner wine enthusiasts. Its compact size allows you to place it on your countertop without taking up much space. The interior LED lighting, the reflective smoked-glass door and the designer style make it look more like a chic accessory on your counter. With an adjustable temperature range of 44-66°F, you can set it to your desired temperature to store a couple of precious bottles to serve any day and to cool a few bottles of wine at a time. The exterior digital touchscreen with temperature display helps you control the temperature easily. As a thermoelectric cooler, Wine Enthusiast 6 Bottle Wine Cooler is energy-efficient and CFC-free. Thanks to its silent cooling technology, it protects the taste of your wine quietly. Also, you can easily fit the bottles on the 3 sturdy pull-out chrome shelves. If you are not sure if a wine cooler is “worth” a try, this compact, and affordable model will help introduce you to the experience. As you enjoy your wine more, you may see it is an excellent value for the price and you may even consider taking it one step further in the future. Get a more detailed view this Wine Enthusiast 6 Bottle Touchscreen review. Due to its innovative design which allows vertical storage of 4 bottles, this wine cooler stands out among its peers. The vertical storage space can be used for opened bottles of wine. This way, you don’t need to worry about finishing a whole bottle just because the wine will spoil once it is opened. Moreover, if you favor using vacuum stoppers for opened bottles, they will fit in perfectly in the cooler as you can place the bottles in an upright position. Also, the 8-bottle horizontal area of Avanti Wine Cooler provides adequate space to preserve your unopened bottles. Thanks to its compact design, Avanti 12 Bottle Wine Cooler doesn’t take as much space for the amount of wine it holds. The curved glass door and the black cabinet add to its stylish looks and make it a nice to have piece of your decor, not just a cooler. With its innovative thermoelectric cooling technology, Avanti 12 Bottle Wine Cooler provides an ultra-quiet cooling environment and minimizes the vibration which is crucial not to disturb bottle sediment. The soft-touch temperature control switches have delayed control mechanism which prevents unwanted temperature changes by random pushes of children. 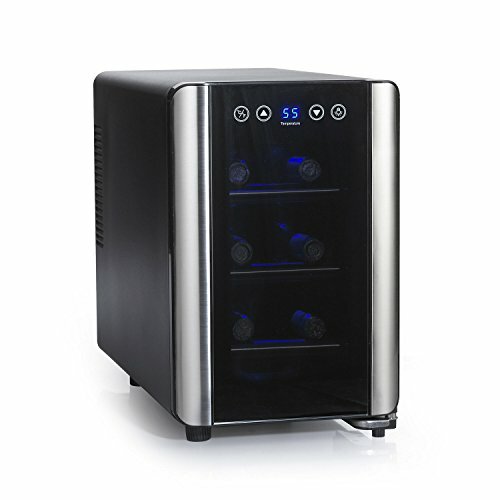 In short, you can find smart looks and functionality in Avanti 12 Bottle Wine Cooler. Click here for our full-featured Avanti 12 Bottle Counter Top Review. Haier 12 Bottle Dual Zone Wine Cellar is the right choice if you love your chilled whites as much as your not-so-chilled reds. As a benefit of dual zone structure, you can adjust the temperature at 46-66°F in the lower compartment for white wine whereas at 54-66°F in the upper compartment for red. This way, you can store your white and red wine separately and serve them at their optimal temperature. Thanks to its thermoelectric cooling system, Haier 12 Bottle Dual Zone Wine Cellar is whisper-quiet, vibration-free and keeps the temperature steady even with fluctuations in the ambient temperature. With its slim design, the cooler unit has a small footprint so that you can place it even in little nooks. On the other hand, it is deep enough so that you can use vacuum seal corks and also have room up front for longer bottles. It has an attractive look with its style, the curved door with smoked glass and the interior LED light. 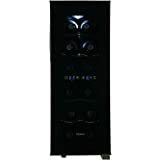 If you are looking for an inexpensive, easy to operate and good looking dual zone wine cooler, Haier 12 Bottle Dual Zone Wine Cellar is a perfect choice. For the ones who like the features of Haier Wine Cooler but not sure about the size, it also comes in smaller and larger sizes. Whynter Wine Cooler is as cool as it gets because it is true to its word of keeping the temperature at its lowest around 46°F, regardless of the ambient temperature. The temperature can be adjusted precisely from the soft-touch digital control panel and stays consistent at the pre-set degree. The unit has a black tinted mirror glass door which is pleasing to the eye and also plays an important role in providing extra protection from UV rays that can affect the consistency of wine. The wine cooler has a soft interior LED lighting which enables you to see through the glass door into the cooler. Besides being useful, this light adds a nice glow and even functions as a sweet nightlight. Being a thermoelectric cooler, Whynter Wine Cooler is vibration-free, quiet and long lasting. The cabinet is deep enough to store taller bottles and the racks are light yet very stable. They don’t come out when you pull a bottle out which is an advantage as it prevents any accidental losses. The unit has leveling legs, which is a plus among others. If you want to keep more than a few bottles and especially chilled whites, Whynter 20 Bottle Thermoelectric Wine Cooler is your type. With its functionality and sleek design, this cooler can make a sophisticated addition to your home. Explore more of this cooler’s features with our comprehensive Whynter 20 Bottle review. You can be a beginning collector with many precious bottles or a connoisseur with years of experience, NewAir AWR-460DB will definitely meet your expectations with its advanced features and all-inclusive design. Thanks to its front venting system, this cooler is suitable for built-in use. Still, with its stainless steel elegant design, you can place it anywhere of your choice as a freestanding unit. Moreover, the reversible door gives you more freedom in where to place your cooler and the door lock keeps your wine safe from intruders. The dual zone structure enables you to conserve red and white wine in separate compartments with independent climate control and keep them at their optimum serving temperature. The adjustable wooden shelves provide a spacious and customizable interior that holds up to 46 bottles. NewAir AWR-460DB offers an adjustable temperature range of 40-66°F so that you can set for long-term storage or ready to serve. The compressor cooling maintains even temperatures throughout the interior and you can adjust the temperature precisely from the digital control panel. The unit has a built-in carbon filter to prevent odors and a blue LED light that reflects a nice hue on your collection. If you are looking for a smaller wine cooler from NewAir, you might want to check 18 Bottle version. If you are looking for a high-quality wine cooler with good storage capacity and top-notch attributes, NewAir AWR-460DB is an excellent choice for you. How to Store Wine at Home? The key to storing any wine at home is to keep heat away from it. It can range from 7 to 18 degrees centigrade, but 13’C is almost perfect. Anything higher than 21 ‘C will age wine and eventually lose its characteristic flavors and aroma. Learn more about ideal wine temperatures and storing requirements, including the temperature ranges as represented in degrees Fahrenheit. Aided in some part by direct publication channels such as YouTube, foodie blogs, and cheap domain names, the wine experience market as witnessed an explosion over the past few years. We purposefully call it a wine enthusiasts’ experience as opposed to a mere wine drinking market because there are so many dynamics surrounding wine these days. To the true wine enthusiast, the wine lover’s experience goes beyond the process of popping a bottle of your favorite variety and enjoying a glass. The wine lover’s experience today has evolved into a big part the quintessential wine enthusiast’s lifestyle, with the help of accessories such as wine coolers. The wine cooler, in particular, has brought the entire wine enthusiast’s experience into the wine lover’s home, making it more affordable to store, display and chill some of their favorite bottles for optimal consumption. Wine coolers, in particular, are taking center-stage as perhaps the main supporting acts to the consumption of the actual wines themselves. Wine coolers in their many varieties are also becoming cheaper and cheaper, making them more and more accessible to a new creed of wine enthusiasts. Wine storage used to be a rather expensive exercise, with the typical wine connoisseur of days gone by having to fork out a hefty sum for a built-in wine cellar, usually housed on the basement floor of their house. The advent and explosively growing popularity and availability of wine coolers have bridged that gap between a big budget and a deep-running love for wine, giving just about every wine lover the opportunity to take their enthusiasm for wine to the next level and bring it right into their own space. But how does one go about selecting a wine cooler, though, particularly taking into account the ever-growing list of available options from just as many manufacturers? Real wine enthusiasts whose love for wine has them seriously considering investing in a dedicated wine cooling device will at this point know that buying a wine cooler is in no way like buying a regular refrigerator. If it was ideal to store your wines in a standard home fridge, there’d be no purpose-built wine cooling appliances like electric wine cellars, wine refrigerators, and wine coolers. The wine cooler you ultimately decide to invest in naturally has to complement all your wine storage and wine displaying needs, whether current or in the immediate to long-term future. It is with this consideration in mind that you should go about picking out the ideal wine cooler. These considerations can be broken down into a list of three (3) main pointers to consider, which can be further broken down to some specific variables and values that best suit your requirements. How it operates; how do you monitor the temperature and how do you set/change the temperature settings? Finally, when browsing through wine coolers with the view of settling on one that best meets your needs, you have to consider the wine cooler’s functionality. This is done through looking at the features list and trying to translate that into a practical setting. In other words, what exactly will you be using it for and, with that in mind, which cooler has the widest range of features that coincide with what you’ll be using it for? For example, if you want a versatile wine cooler in which you can store both your red and white wines, you might consider a dual-zone cooler with independent temperature cooling compartments that have respective temperature ranges. These independent cooling zones and their respective temperature ranges would then be optimal for the storage of the different wine varieties at temperatures best suited to them. Some of the consideration points are self-explanatory, like the bottle capacity and whether you want an under counter, countertop or freestanding cooler. With regards to the temperature range and which types of wine, you’ll want to store in your cooler, the cooling technology used (thermoelectric vs. compression cooling) plays an important role. If you want a bigger capacity cooler (24-24+ bottles), you might have to settle for a compression-cooled unit, which isn’t a bad thing because compression coolers are known to last longer and are more powerful. Coolers with compressors generally hold internally set temperature well and this internal temperature is not dependent on the ambient air temperature of the room the cooler is housed in, as is the case with thermoelectric coolers. Similarly though, although thermoelectric coolers’ interior temperature is somewhat affected by the ambient air temperature, if you live in an area or if you place your cooler in a space with very low-temperature swings, this apparent flaw becomes irrelevant. Thermoelectric coolers are generally quieter than their compression-based counterparts, more energy efficient and give off less vibration. So, it should be becoming clearer to you by now that it’s simply a matter of looking at the features of the cooler you’re considering and then translating those features into a physical application as it would play out in a practical setting. A couple of the consideration pointers and features will require some compromise on your part because wine cooler manufacturers tend to look at the general wine storage requirements of wine enthusiasts at large, thereafter proceeding to aggregate those requirements and then incorporating those averages into their designs. This is not to say you won’t find the perfect wine cooler that perfectly suits all your needs down to the tee, however, but keep an open mind and you’ll definitely be in possession of a wine cooler which is the closest fit to all your requirements. Two types of cooling technologies typically go into wine coolers, namely thermoelectric cooling and compression-based cooling. The technical specifications of exactly how each cooling technology works aren’t all that important to a wine enthusiast, but there a few details about these technologies with direct implications on the way in which your wine cooler works. Definitely, the environmentally-friendlier option between the two cooling technologies, thermoelectric cooling used in wine coolers translates into quiet operation with very little to no vibration. This means less power is consumed so bigger savings on your electricity bill and you also have less of an impact on the environment. Thermoelectric cooling tech is mostly used in wine coolers with a lower bottle capacity, typically those which carry from 6 to 18 bottles, sometimes a little more. Compression cooling technology is a little older than thermoelectric cooling, predominantly used in traditional refrigerators. Compression cooling is more powerful than thermoelectric cooling but also has a bigger impact on the environment due to the use of CFCs and HCFs (although modern compressors have phased out the use of these environmentally harmful gasses). Compression-based cooling technology is typically used in wine coolers with larger bottle capacities (24+ bottles). The power of a compressor in cooling units ensures much quicker cooling (the unit reaches the set temperature much quicker than in a thermoelectric-cooled appliance). Compression cooled units are also not dependent on the ambient temperature, so unlike with most thermoelectric coolers, compression-based wine coolers will maintain the set temperature regardless of the air temperature of the room you put the cooler in. A compression-based cooler is usually much louder though and compression-based wine coolers generally use up more power. 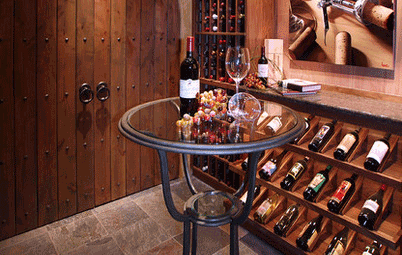 The application of a wine cooler simply refers to where and how you install or place it. Countertop coolers are usually smaller-capacity units which are portable and are designed to be placed on top of a counter. Most countertop coolers are extensible in their application, which means they can also be used as freestanding units. So you might also place it on the floor in a man-cave or in the living room, as opposed to exclusively placing it on top of a counter in your kitchen. A built-in wine cooler as the name suggests is one which was designed and built to be integrated into some sort of interior cabinetry. 12-15” wide wine coolers are typically built into cabinetry space left vacant by an old trash compactor, but there are many different types of built-in wine coolers. Some of them can also be used as free-standing units if you don’t necessarily want to build it into any cabinetry. Freestanding coolers are usually larger units which are placed in any open area, like in an entertainment area, in the garage maybe, in a man-cave, in a home bar, or anywhere else where it’s not to be attached to anything else. This is perhaps the most common classification property used in the comparison of the different types of wine coolers available. As far as the number of temperature cooling zones goes, you get single-zone coolers and dual-zone coolers. It’s very rare to find more than two cooling zones (up to three) as those types of coolers would be custom-built for commercial use as opposed to domestic use. Dual-zone coolers have two cooling compartments or “baskets,” designed this way to offer users the ability to store two or more different types of wines at their optimal serving/storage temperatures. The temperatures usually have different ranges, e.g. the top temperature zone would maybe have a range suitable for white wine while the bottom zone’s range would be better suited to store red wines. The temperatures are independently controlled and the predominant design style is that of one cooler door opening up to both temperature zones / cooling compartments. Light: Direct light can easily lead to wine faults. Humidity: A certain degree of humidity is required to sustain the quality of the wine (Experts note that 70-75% is ideal). If the cork dries out, that can allow air into the bottle which can cause the wine to oxidize. Temperature: Experts note that the ideal temperature for wine range from 40 to 65°F depending on the type. 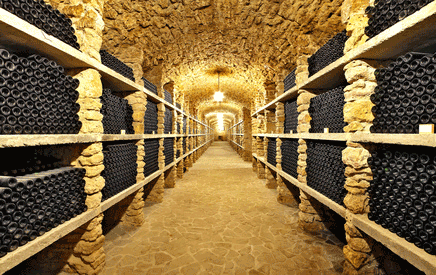 As wine is very sensitive to temperature changes, it should be stored at a stable temperature. Otherwise, it can mature earlier or spoil. Wine coolers bearing the EdgeStar brand name are unmistakably distinctive in their appearance. If you’ve seen a few EdgeStar units in your life, you’ll notice the next EdgeStar wine cooler you see without catching sight of the name. This speaks volumes of the options you have with regards to defining and reinforcing your own personal style in wine coolers. An entertainer’s dream, EdgeStar wine coolers are also built to deliver a good measure of practicality in their deployment. 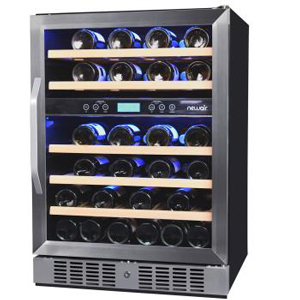 With some very affordable yet feature-filled wine coolers in their huge range, EdgeStar particularly caters to a specific type of wine enthusiast. 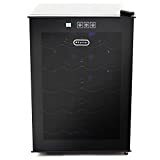 Pioneering wine enthusiasts who led the way in moving away from traditional basement-bound wine cellars to this array of electrical wine coolers we have today will 9/10 times have an experience with the EdgeStar name to speak of. Forming a very good part of the Living Direct parent company of home appliance manufacturers, the EdgeStar name in wine coolers grabbed the initiative as a pioneering manufacturer of wine coolers and has remained popular amongst consumers to this day. A very wide bottle storage capacity range of 28, right up to a colossal 300 bottles, presents a lot of options to choose from. See if you can find the perfect cooler for your needs by checking out our EdgeStar cooler reviews. If you’re considering buying a wine cooler from Avanti, your main motivation would be to benefit from the special attention they pay to produce wine coolers that complement the consumers’ lifestyles. Every type of wine lover, from the beginner collector right up to the vastly experienced connoisseur, can come away with a wine cooler from Avanti that’ll fit perfectly into their wine enthusiast’s lifestyle. The Avanti name isn’t popular for nothing, with this popularity actually going beyond their range of wine coolers and spilling over into their entire range of electrical appliances. 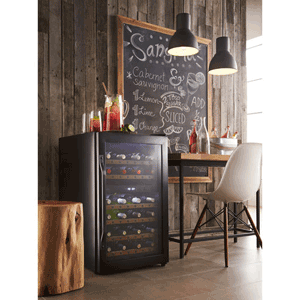 Avanti wine coolers are as much a wine lover’s dream as they are an interior decorator’s dream. While the technical specifications are what will ultimately swing the buying decision of the wine enthusiast, any Avanti wine cooler comes with a characteristic compactness and progressive design which will fit into just about any setting earmarked for the storage, display and cooling of wines. Whether you want to keep a few bottles perfectly chilled at their ideal serving temperature or indeed if you want to store up to 166 bottles over the long-term, Avanti’s range of wine coolers will show you just why this is such a popular brand. Browse through a few available options on our Avanti cooler reviews page. Danby is another popular brand name of wine cooler manufacturers, but what you’ll realize is that the Danby name is most popular amongst wine enthusiasts who have owned more than one wine cooler in their lives. This is because an experienced wine enthusiast can look at the feature list of a Danby wine cooler see the unit for what it truly is; an elegantly designed cooler with the inherent potential to add loads of class to any interior space it’s housed in, but also, one which has a well-balanced set of all-around features. 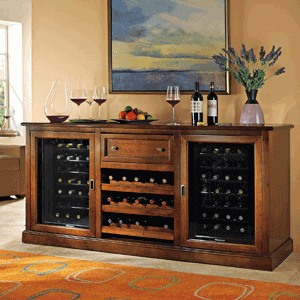 A typical Danby wine cooler of any capacity comes standard with real post-sale value. If you purchase a Danby wine cooler with the appropriate warranty option (extended warranty), the post-lifespan operational costs of keeping your Danby cooler running well will work out to far less than other options. This is not to say Danby coolers are not built to last, however; Danby makes some high quality, strong coolers that will preserve your wines as well as they display them. Choosing the right Danby cooler can also afford you some great extensibility, which plays out in your ability to store cheese along with your wines, or maybe even use your cooler to store other beverages once in a while. Have a look at our Danby cooler reviews for more detailed info and options. Forming the other half of the Living Direct parent company of wine cooler manufacturers, the Koldfront brand name takes design elegance to the next level. 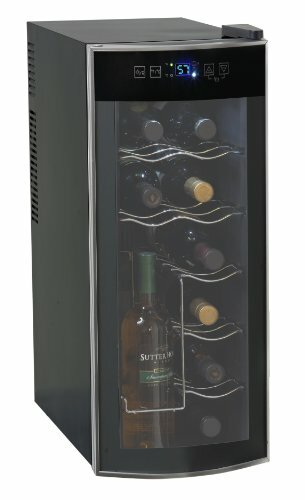 This next-level design elegance can be especially witnessed in Koldfront’s Series 7 range of wine coolers, which bear a uniquely modern and contemporary style. Looks are definitely the major pulling force which draws in potential consumers, but once the plethora of integrated features is explored; it very quickly becomes apparent that Koldfront has a wine cooler to suit every budget. That’s largely where Koldfront coolers draw most of their growing popularity, but what makes Koldfront wine coolers even more popular is the interchangeability of features and design style. With many coolers from other manufacturers, it’s generally a case of wishing a particular design style coincided with a certain set of features you’re specifically looking for. That’s not the case with Koldfront coolers because you’re very likely to find a Koldfront wine cooler that caters to your functionality needs and bears the design style you’d select as your first choice. Koldfront’s range of wine coolers is so versatile that some of their units can be used for commercial purposes as well. Any Koldfront cooler which caters to commercial usage needs is one which is naturally built to last. Check out our Koldfront wine cooler reviews to find the perfect one for you. The Haier brand is also very quickly growing in popularity, particularly amongst beginner wine collectors who are on the lookout for wine storage capacity bottles that get as compact as half a dozen bottles. If you are truly limited for space or if you only have a few of your favorite bottles to keep chilled at optimal serving temperature, it would only make sense to consider a Haier cooler. Perhaps the Haier brand’s most solid claim to fame though is the fact that even though a lot of their popular units house a smaller number of bottles, they still put a lot of effort into the design, functionality, and performance. 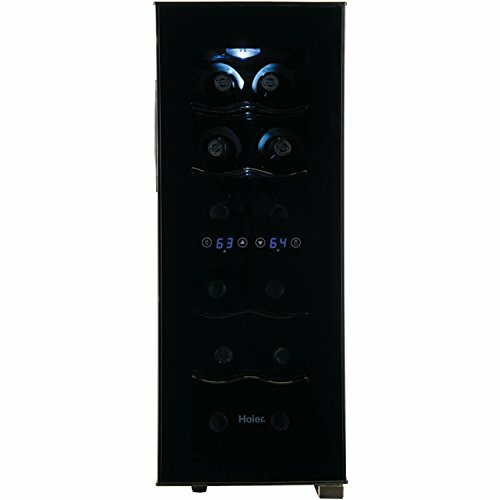 Haier wine coolers offer a nice temperature range and are at times unrivaled in the way they look. It’s no wonder why Haier is fast becoming the go-to brand for compact wine storage, particularly among wine enthusiasts who need a versatile wine storage solution to fit in with their varied wine-lovers’ lifestyles. Haier coolers also offer some great extensibility and you can check out or Haier reviews to see if you can’t find a perfect fit for your wine chilling needs. 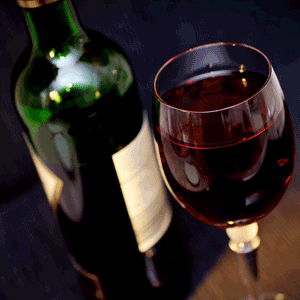 Wine is a type of alcoholic drink that is made by fermenting grapes. Other types of wine are made with fruits and plants but will not be discussed here. The oldest wine ever found in human history would be that of fermented honey, rice, and fruit residue in China around 7000 BCE. By 4100 BCE, the oldest winery has been established in an Armenian cave. It was around 1500 to 300 BCE that the Phoenicians showed Vitis Vinifera all over the Mediterranean region. However, it was the Romans that spread wine grapes throughout Europe until it fell by 500 AD. The Loire Valley has the Chateau de Goulaine established at 1000 AD. It is the oldest and still operating a winery in existence. Pinot Noir is used to be known as Morillon in 1200 and Muscat Blanc as Muscatellus in 1304. By the time the Black Place ended in 1400, wine is the safest beverage to drink compared to water. Around 1500, Muscat Blanc, Pinot Noir, Tempranillo, and Riesling were established as common wines. The New World gets wine grapes courtesy of the Portuguese and Spaniards in 1530. Madeira appears in 1600 as vinho da roda, the wine that has been aged on sea travel. Fifty years later, Cabernet Sauvignon is born in Bordeaux. Dom Perignon develops champagne in 1693. 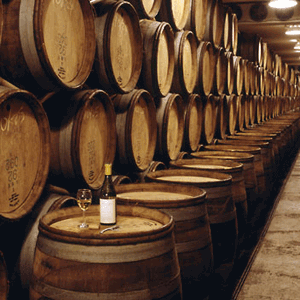 By 1752, port wines such as Port, Constantia, Tokaji, Sherry, Sauternes, and Madeira become popular. In 1964, Sangria invades the United States at the World Fair in Seattle. 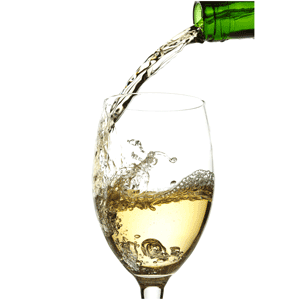 Wines are classified as either white or red. A versatile wine that takes on the flavors and aromas depending on where it is grown and stored. It’s fruity like apple and lime in colder climates or takes on tropical fruits in warmer regions. Oak barrels impart it with honey and butter flavors but fresh on the palate when stored in stainless steel. Seafood is its soul mate, especially oysters. Crisp, clean wine with a hint of green apple, pear, and lime. As it ages, it will develop honey taste and oily aromas. It pairs well with spicy foods as well as poultry and pork. Pinot Gris. Sharp, crisp, and refreshing wine when done Italian style or rich and spicy when done the usual. It’s taste and aroma depends on where the grapes are grown and how it is stored. Great with seafood, pasta, poultry, or vegetarian fare. Sauvignon Blanc. Fresh, crisp, and fragrant and tastes somewhat of grapefruit and grass. You can’t go wrong with it as it works well with seafood, poultry, and vegetable dishes. It is a mild, supple wine with fruity flavor of plum and blackberries and hints of mint, chocolate, and eucalyptus essence and aroma. Like the Cabernet Sauvignon, it is best for meat especially the ones like beef and lamb. Cabernet Sauvignon. This is a stronger version of Merlot as it has more tannin and better aging aptitude. It can taste like blackberries, plums, and black currants. Since it is aged in oak, it can also take on vanilla, chocolate, and coffee flavors. Pinot Noir. It is a subtle wine that tastes of red fruits like cherries, raspberries, and strawberries. These become more complex with age and develop earthy notes such as that of mushroom and decaying leaves. This wine is very versatile as it can be taken with poultry, salmon, meat, and vegetable dishes. It is described as big, bold, and spicy with rich aromas of leather and black fruit. It pairs well with lots of food but most especially with grilled meat. Regardless of what you want to purchase, it is definitely not easy to find a product that suits your needs. Still, it would be fair to admit that when it’s a more common item that everybody has, it gets easier as you can ask your friends about its performance or you simply have the chance to observe. Even though a wine cooler may not be considered as a “must have” for many people, for a person who really likes wine and has an interest in different tastes, it proves to be essential and highly useful than a “nice to have” item. Ultimately, wine lovers know that if you give your wine the TLC it deserves, it offers you its full taste in return. That’s why we aimed to aid you in selecting the wine cooler you are looking for by providing insights into the products that stand out in the market. We hope that our wine cooler reviews helped you choose the one that meets your expectations and find “your best wine cooler”.